Note: The higher-current module can facilitate up to 2A continuous current. Thus, if the product being powered requires 2A continuous current, only a standard module can be used with it. However, it's important to take a look at the true power requirements of the unit(s) you're powering. Many times, the inrush current of turning a unit on is more than it's normal operating current. If this is the case, you may employ more modules on the PS-1—up to ~4A total maximum operating current. 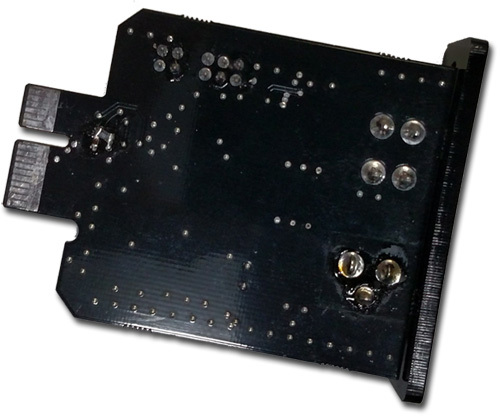 Due to significant cost in parts to produce the higher current module, the high current module is $500 each. High-current module boards are ordered but due to delays, we are expecting completion late-February. Due to high demand, we are taking orders now and will ship on a first-come, first-served basis! Each high-current module can accommodate devices up to 3A max power draw.